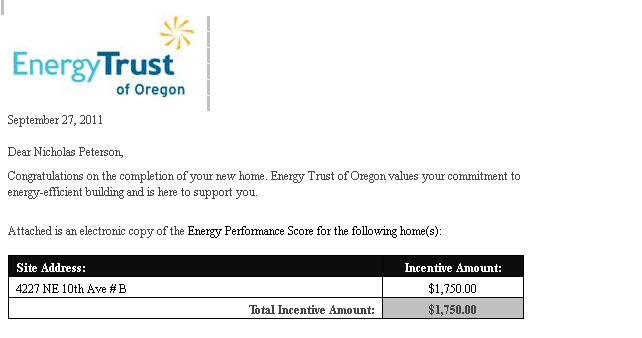 In a previous post, I described an awesome building incentive that was made available for my ADU from the Energy Trust of Oregon (ETO). My ADU project was the first case in which an ADU was allowed into ETO's New Homes program because, unlike most ADUs, my ADU was going to be my primary residence (and the ADU was separately metered). By following the building guidelines laid out by the ETO, which basically meant building to Northwest Energy Star standards, the ADU was eligible for an amount that was in part commensurate with the relatively tight and efficient building techniques that I used. The $1,750 rebate that I received was basically inversely proportional to my low energy performance score of 35. Anyhow, due to some forward thinking decision-making at ETO (incidentally, I've had great experiences with ETO's programs so far), they've altered their program to allow most new detached ADUs to be eligible for these New Home incentives (regardless of who is going to be living in the ADU). Previously, most ADUs had not been eligible because the ADU wasn't intended to be the homeowner's primary residence. The great thing about this program is that it 1) results in a better building product for the homeowner and 2) can give money back to the builder/homeowner in the process. The 3rd party certification that is part of the certification process essentially guarantees that the project is meeting higher quality design and building standards. And if that reasoning isn't compelling enough, 3rd party home certifications have been shown to have a significant positive impact on resale value. Here's the new rules of the program. Contact ETO if you have more questions about your eligibility for this incentive. The New Homes program will pay incentives on Accessory Dwelling Units that fit into two categories: 1) ADU built at the same time as the main residence 2) ADU built after the main residence was constructed. Our definition of an ADU refers to a structure that is permitted as an accessory dwelling unit by the local jurisdiction and is intended to be used as living quarters i.e. bedroom, kitchen, and bathroom, plus has its own USPS mailing address. I would surely give 10 on 10 for such incredible content. Your table are too sword like to feature and relaxed to see.